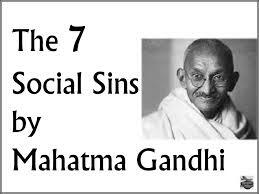 7 deadly sins according to MK Gandhi. This entry was posted in ahimsa, America, apostasy, artists in conflict, barbarian, belief, Beliefs, devotional contemplation and tagged America, Arts, Beloved, christian, MK Gandhi. Bookmark the permalink. ← The veil that prevents us from seeing God. Chilman uthein gi nahi. Song from a movie scene in Kisna.